Quality Accessories by Atlas Infiniti | Atlas Infiniti - Uniform Manufacturers & Suppliers in Mumbai. Sometimes, you may find it difficult to put together a well-thought-of and vivacious ensemble. That’s exactly when fashion accessories come to your rescue, by adding a spark to your ensemble. Accessorizing is the process of complimenting your attire with trendy, colorful elements. It helps bring a boring look to life and use your attire innovatively for different occasions. In context of uniforms whether they are of corporate wear, school wear, hospital wear, the need of accessories such as school bags, socks, caps, shoes for school wear, bed mattresses, over bed tables, floor mates for hospitals, and corporate bags, ties and backpacks for corporate wear. 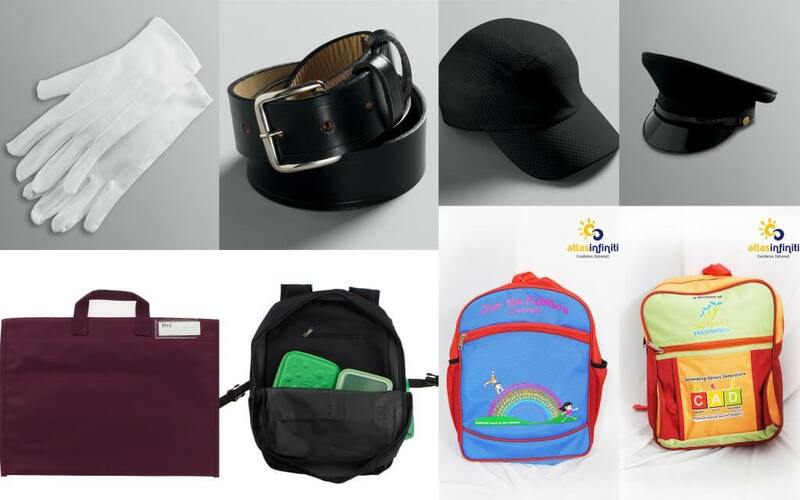 Like we are best in manufacturing different uniforms for school, corporates and much more, we also deal in providing best quality accessories to match up with these uniforms. Style– When it comes to school bags, children identify with the things they own. They either want the one similar to their comparison or the one that looks unique. They want to look cool which they decide through their school bags style. When it comes to shoes and corporate bags, latest trends are looked upon. Atlas Infiniti takes care of these things. Supportive- In context of school bags, the weight of the kid’s future is on their shoulders. Therefore a range of supportive school bags with sturdy and wide adjustable steps should be manufactured. Also corporate bags straps should also have adjustable and supportive straps. Atlas Infiniti also looks in to this matter. Comfort– the major worry of any parent is whether the school bag their kid carries every day is comfortable enough. Especially with the increasing weight showing harm it could cause to students, comfort becomes a priority. A school bag should not be a burden on kids, in fact it should provide comfort to them. Atlas Infiniti understands the importance of comfort provided with a school bag. We provides a wide variety of school bags with utmost level of comfort. Moreover ties, caps, socks provided by us are also of great comfort because comfort is that thing which depends upon the quality used. The quality used by us in manufacturing bags, uniforms or any other accessories is the best and of worth material. Durable – Durability of any accessory depends on the quality it is made of, if the quality is of worth then it will last longer, i.e. it will be durable. Atlas Infiniti provides every accessory of worth quality and hence providing durable products. Contact Atlas Infiniti for Quality Accessories! Atlas Infiniti not only provides above mentioned quality accessories but also works on customers feedback and do the needful requirements. Customer and a manufacturer relationship relies on trust and faith. Atlas Infiniti is the right manufacturer which provides its customers with utmost faith and trustworthy commitments.